Everyday skincare products focus on specific skin issues without treating the causes, often creating problems of their own. Au Natural Skinfood works smarter. Its effective system of four premium daily-use products work together to improve the overall health of your skin, eliminating bacteria on the skin’s surface while strengthening its natural barrier. Healthy skin takes good care of itself. Our skin is the largest organ of our body. Our skin’s barrier plays a very important role in keeping us alive and well, helping to protect us from outside threats such as viruses, bacteria and UV damage. It also keeps moisture inside our bodies; water is vital to keeping our organs working as they should. Healthy skin with a strong barrier defense system has all the powers to regenerate, hydrate and protect itself. The stronger our skin’s barrier function, the more we can use our skin’s own natural defense system to fight all environmental damage. Effectively healing the skin barrier means minimizing trans-epidermal water loss and protecting the skin from further irritants and environmental damage. We can protect our skin’s barrier to support optimal health by maintaining a healthy diet with a variety of fruit, vegetables, healthy Omega 3 fats, and by reducing our stress levels, drinking water and staying away from aggravating factors such as caffeine, smoking and alcohol. Au Natural Skinfood’s science-backed research shows that we can further protect our skin using the correct ingredients topically, positively influencing our skin’s barrier function, resulting in repair and a thicker skin. Au Natural Skinfood products have been developed using quality New Zealand ingredients to help induce and enhance skin barrier repair, naturally and without parabens, allowing the skin to be the best that it possibly can. Au Natural Skinfood products address points of vulnerability simultaneously by using key New Zealand ingredients, optimising the skin’s natural ability to repair itself. No matter what your skin type or condition, using Au will enable your skin’s own defense system to protect you from conditions such as dryness, acne, premature aging, oily skin, compromised skin and diffused redness. Active 16+ Manuka honey offers powerful natural solutions to protecting and improving skin’s barrier function. Humectant and emollient properties draw moisture to our skin’s cells, softening our skin and protecting it from dryness, cracking and moisture loss. Hydrogen peroxide gives honey its antibiotic quality, while methylgloxal (MG) has protective antibacterial qualities that stimulate the production of special cells that repair tissue damaged by infection. Our skin reacts to bee venom as an irritation, as if it has been lightly stung with the peptide Melittin. This supports blood circulation to the deep layers of the skin, stimulating cell regeneration and the production of elastin and collagen to repair lift, plump and tighten the skin. Bee Venom is also known to dissolve skin cell membranes and increase skin permeability. This action enables improved penetration of skin cells and skin tissue by Au Natural Skinfood’s other bioactive ingredients, resulting in increased effectiveness. Independent scientific research was conducted by Trinity BioActives Laboratories in New Zealand on the Human Skin Cell Proliferation Testing commissioned by Natural Health Products Limited with the assistance of a New Zealand Government Ministry of Science and Innovation grant. The objective of the research was to test the effects on skin cell proliferation/stimulation of eight test samples which contained various BioActive ingredients from the Aú Natural Skinfood range. 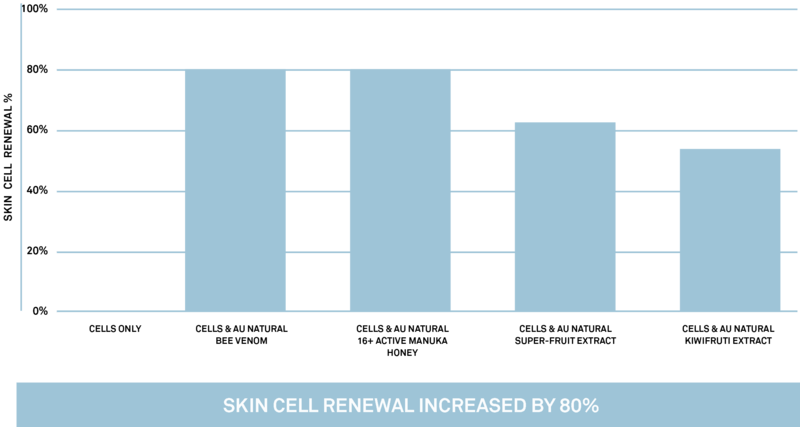 The tests showed significant results, in particular that the Active 16+ Manuka honey and the New Zealand pure bee venom used in Au products enhances skin cell renewal by more than 80% compared to other natural skincare products. Au Natural’s Exclusive Super Fruit Extract is a highly bioactive blend of blackcurrants, boysenberries, grapes and kiwifruit extracts. 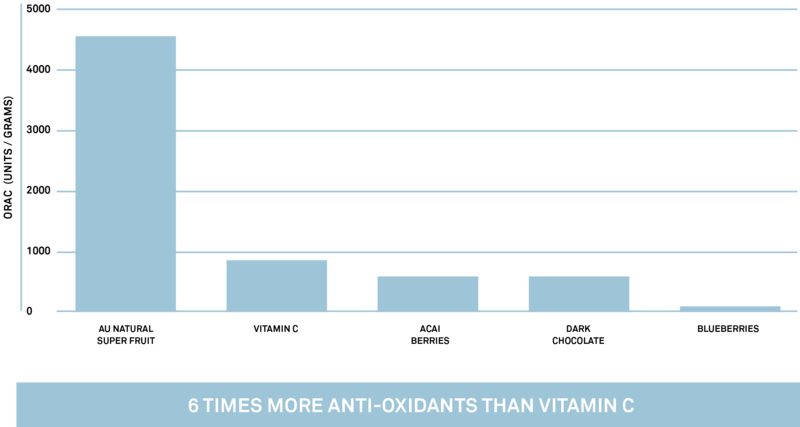 Au Natural Super Fruit Extract has an ORAC value (measure of antioxidant levels) 6 times that of vitamin C and contains very potent antioxidants that help diminish the sun’s damaging effects and reduce free radical damage. It improves skin elasticity and increases skin hydration. Kiwifruit extract is high in essential fatty acids and anti-oxidants, making it a wonderful anti-ageing extract. 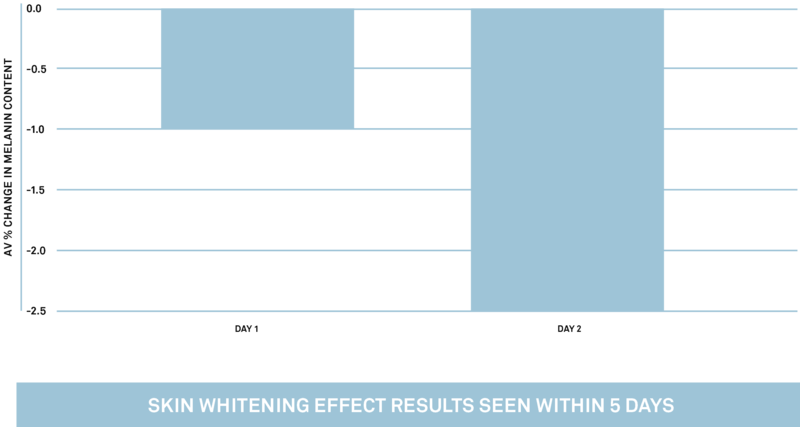 It has been scientifically shown to inhibit melanin production and deliver brightness with its unique lightening and whitening action. It helps to restore clarity and reduces the appearance of redness, dark spots and skin pigmentation caused by the ageing process. Unlike skincare products, Au Natural Skinfood prepares your skin for the life you live. Healthy skin is a journey, not an instant fix. Used routinely over time Au Natural Skinfood will improve your skin’s health, leading to better looking skin. Rejuvenated, your skin will naturally glow.